Something about the DeLonghi design lends itself to imitation. There are a few brands on the market now that share the look of this model. 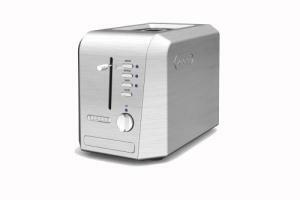 In the case of this Esclusivo Toaster, the look is so distinctive as to be more suited to a laboratory than a kitchen. My first thought when seeing this was that it sterilized test tubes, along with making toast. This 2-Slice toaster is made of heavy brushed stainless steel. I'm not kidding- it weighs in at over 6 lbs. Part of that weight is in the buttons and knobs, which are all made from die-cast metal. A substantial package for sure. Add to that the standard controls for Cancel, Defrost, Reheat, and a Bagel setting that activates only one side of the heating elements in each slot. The settings are all clearly indicated when in use by blue LEDs. The unit has an extra-deep crumb collection tray that slides out from the end and is dishwasher safe. The slots are not only wide but deeper than the average toaster, apparently. The thermostat is supposed to use sophisticated electronics to monitor temperature. Still, I would sacrifice a couple slices of bread to dial this in just right, as the control panel's six "Darkness" settings seem a bit ambiguous at first glance. Hey, if you're not happy with the toast, try sterilizing a couple test tubes.